I’ve been busy making the samples for our upcoming classes, starting with a lampshade and a crafting bag, followed by bunting and a printed tote bag for the childrens classes planned for the summer holidays. 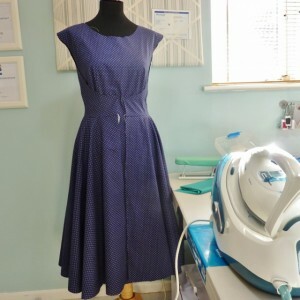 …and now I’m working on the wonderful “sewing bee” wrap dress. I’ve just finished sewing it together, and am now letting it rest overnight before I do the back skirt hem and sew on the white bias binding and the buttons.